On May 2, members of the legal profession from across New Mexico gathered in Albuquerque to celebrate the U. S. justice system. Established as a nationally recognized day in 1958 by President Dwight Eisenhower, each year’s Law Day follows a legal theme to highlight its importance to the American legal process. This year’s Law Day theme was “The 14th Amendment: Transforming American Democracy,” which formed the basis of the keynote address given by Chief Judge M. Christina Armijo of the U. S. District Court for the District of New Mexico. It also served as the foundation for this year’s high school essay contest. Modrall Sperling is proud to honor the late James E. Sperling through our ongoing sponsorship of the State Bar of New Mexico Student Essay Contest. Mr. Sperling practiced law with Modrall Sperling from 1946 until his death in 1991 and served for many years as the firm’s president. Mr. Sperling also dedicated years of public service to the New Mexico legal community. 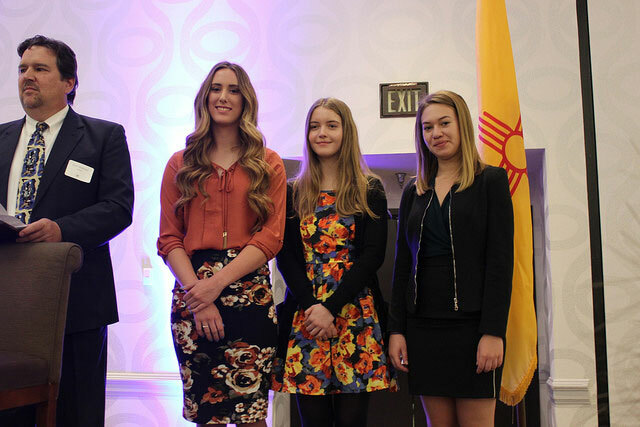 This year’s essay contest winners were Gina Sanchez, East Mountain High School, Sandia Park, First Place; Olivia Taylor, Los Alamos High School, Los Alamos, Second Place; Maya Handly, Centennial High School, Las Cruces, Third Place. All were presented a check by Modrall Sperling Shareholder and Treasurer Earl E. DeBrine, Jr.